Non-Stop movie hyphen: Why isn’t it spelled Nonstop? 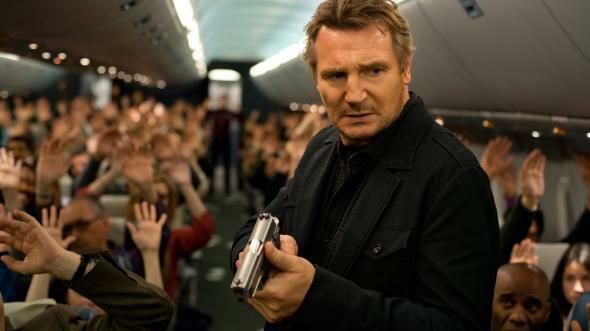 Why Is Liam Neeson’s New Film Called Non-Stop Instead of Nonstop? When you search for a flight on Kayak, you’re given an option of limiting your search to “nonstop.” Merriam-Webster gives definitions of “nonstop” as an adjective, adverb, and noun. The Associated Press’s stylebook states that “Nonstop is one word,” and the New York Times agrees. Why, then, is there a hyphen in the middle of the title of Liam Neeson’s new movie Non-Stop? I emailed this question to Universal Pictures’ publicist three weeks ago, and as of yesterday, her response was “we just haven’t received an answer for you unfortunately.” Shockingly, Universal Pictures doesn’t prioritize pedantic grammatical questions when it’s promoting $50 million action thrillers. However, as a strong proponent of dropping hyphens wherever possible—and, like everyone else at Slate, an adherent of AP style—I couldn’t let the studio’s stonewalling stop me from investigating the film’s aberrant spelling. It’s possible, of course, that Non-Stop is just a typo. Hyphens have tripped up film studios in the past—recall The 40 Year-Old Virgin and Eight Legged Freaks (which you might have guessed from the title was about an octet of weirdos who, like most people, have lower appendages). But “non-stop” isn’t so much a misspelling as a nonstandard spelling. It seems more likely that someone chose to render the movie title that way because the hyphen looked better, or more natural, to them. What kind of person might think that? Well, a British person, for one. In general, hyphenating words that begin with “non-” is much more common in British English than in American English. The Oxford English Dictionary spells it “non-stop” and dates its first usage to 1900. If you seek air travel on the British version of Kayak, you’ll find that flights that go directly to your final destination are described as “non-stop.” And with Liam Neeson and Downton Abbey star Michelle Dockery headlining the cast, you might think a British production team is behind the film’s bafflingly nonstandard spelling. That’s not exactly the case. Five production companies are behind Non-Stop. Two of them (Universal Pictures and Silver Pictures) are American. One of them (LOVEFiLM International) is based in London. The remaining two—StudioCanal and Anton Capital Entertainment—are French and Luxembourgish, respectively. As it happens, the French translation of “nonstop” is “non-stop” (say it with a nasal “non” and a percussive “p”). So perhaps the fact that three of the production companies behind Non-Stop come from countries that spell it with a hyphen contributed to the spelling of its title. But this isn’t an open-and-shut case. And I would make the argument that, regardless of its international pedigree, the movie should be called Nonstop. Non-Stop’s screenwriters are three Americans, one of its headliners (Julianne Moore) is American, and the film was shot primarily in New York (according to IMDb). Universal Pictures, the film’s wealthiest production company, is of course based in the States. Surely the country that pours the most money into a movie should get to determine how that movie’s title is spelled. Even though Non-Stop’s producers apparently don’t care about American spelling conventions, they should regret that hyphen for another reason: The Internet is not friendly to excessive punctuation. The film’s website—nonstopthefilm.com—urges fans to use the (correctly spelled, if erratically capitalized) hashtag #NonStop.